Kawaii—the culture of cuteness, originating in Japan—is everywhere. It’s time to make your own contribution! 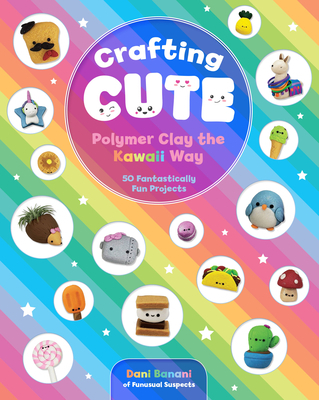 Join the cuteness revolution with these amazingly easy-to-make projects using polymer clay. A tools and materials section introduces the few things you’ll need to get started, including techniques on softening the clay and color mixing. The projects are divided into three sizes, beginning with the smallest and easiest. You can choose to make just the characters or, depending on their size, learn how to transform them into earrings, rings, necklace charms, plant containers, and a range of desk accessories. The first section presents instructions on creating 25 itty-bitty and ridiculously cute characters, including a pineapple, French toast, waffles, bacon and eggs, donut, taco, sloth, and unicorn—scaling up in difficulty as you go. The 15 mid-size pieces include adorable whale, hedgehog, unicorn, and pumpkin characters as plant holders, desk accessories, ring holders, and more. Wow your friends with the 10 large “showstopper” pieces that include a penguin North Pole pen holder, a beach-themed piece featuring sea creatures, a campfire scene, and a reading owl perched on a pile of books. Since launching her Etsy shop in 2014, FunUsualSuspects, Danielle Clark has risen to become one of the top-ranking artists on the very popular crafting platform. Out of 1.9 million stores there, she consistently ranks in the top 1%. Danielle lives in the Pacific Northwest and her work has been featured several times in Buzzfeed, Seattle Times, and other media outlets.